Fraser Court Seafood Restaurant (map, 3489 Fraser Street, Vancouver, BC, Canada, phone: 604-568-1288) is located on the more residential, less kitschy side of the Mount Pleasant neighborhood of Vancouver. Much improved over its previous incarnation as Pink Flamingo, Fraser Court is even more successful at drawing the weekend morning crowds, hungry for the restaurant’s authentic and delectable take on Chinese dim sum and specialty dishes. 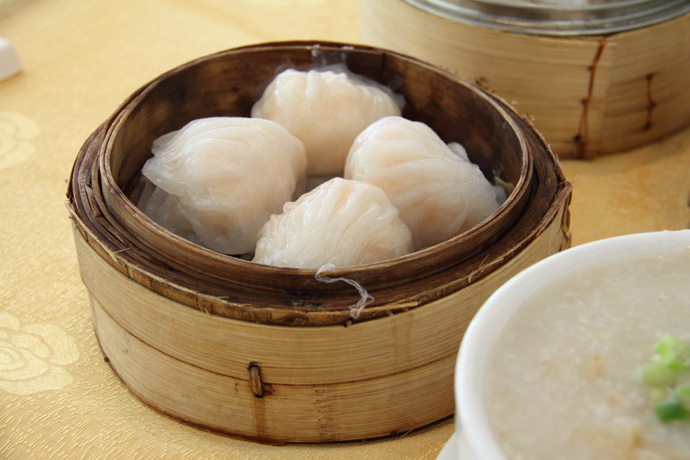 Here you will find a wide selection of the dim sum staples such as freshly steamed har gow (shrimp dumplings, pictured below), sticky rice wraps, and warm congee soup with classic add-ins (also pictured below). 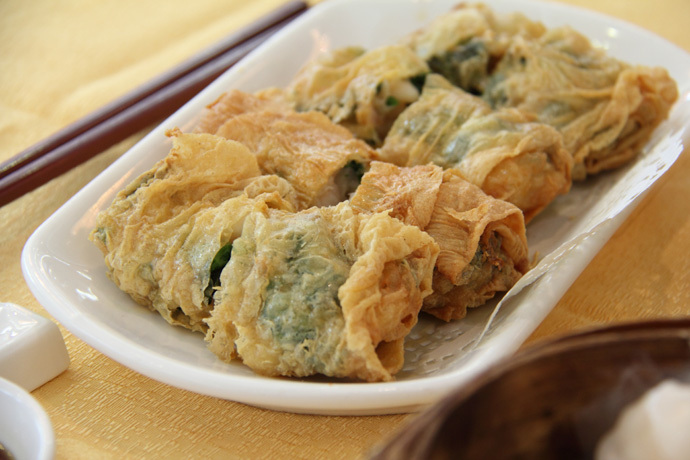 Or, if you like exploring deeper into deliciousness, go for more adventurous dim sum variations like chewy mushroom dumplings or crunchy bean curd and shrimp rolls. The dining room is large and bright, with all the fixings necessary for a big Chinese wedding banquet (which do happen here quite often). You can expect a bit of a wait on Saturday mornings (as with most popular dim sum places), but with their decently priced menu and large selection of tasty dim sum, Fraser Court is a terrific place to take friends and family. Check out Fraser Court to sample some very competently prepared Chinese cuisine and experience a great Vancouver take on Chinese Canadian contemporary culture. Har gow (shrimp dumplings) from Fraser Court dim sum seafood Chinese restaurant in Vancouver BC Canada. More dumplings from Fraser Court dim sum Chinese food restaraunt in Vancouver BC Canada. Great seafood! Bean curd and shrimp roll Chinese Dimsum from Fraser Court restaurant in east Vancouver BC Canada. Chinese dim sum Sticky Rice from Fraser Court Seafood restaurant in Vancouver BC Canada. 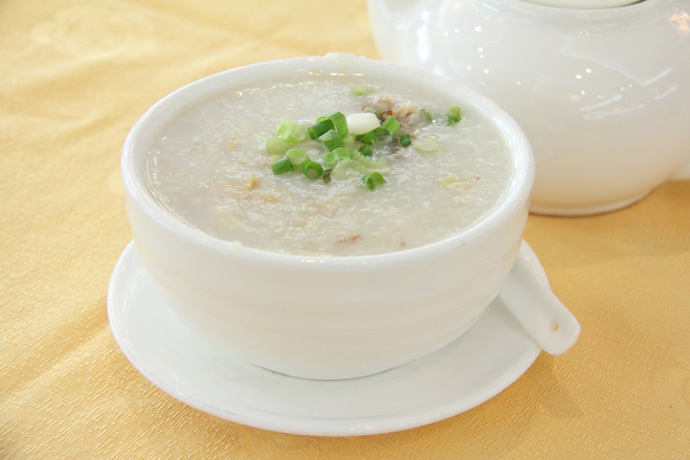 Chinese style Congee from Fraser Court Chinese restaurant in Vancouver BC Canada. YEW restaurant + bar (map, web site, 791 West Georgia St, Vancouver, Canada, phone 604-692-4939) is located in the Four Seasons Hotel Vancouver, one of Vancouver’s most luxurious hotels. We enjoyed their special menu for Dine Out Vancouver 2009, which was $38 per person before tax, tip, gratuity, and drinks. 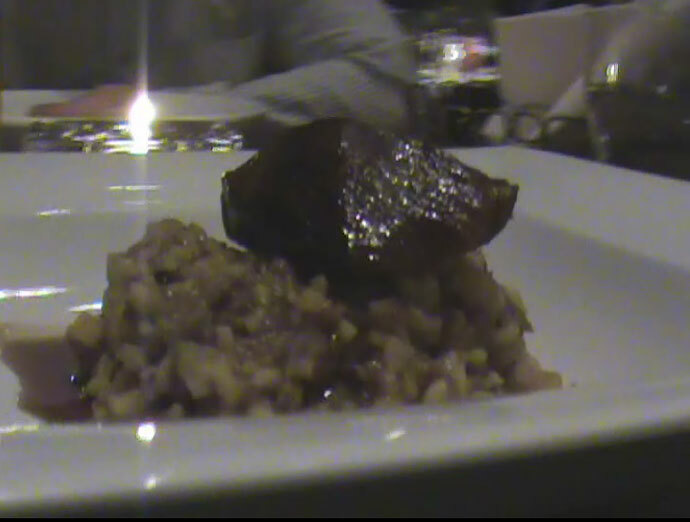 The atmosphere is awesome, the service is impeccable, and the restaurant’s food is very impressive. We were a little cowed by the wine list, which had the cheapest wine by the glass at $9.00 and a half litre for $30. So we didn’t order drinks, but the food (as shown below) was fabulous. I made a video of the dishes (which you can view using the player below). 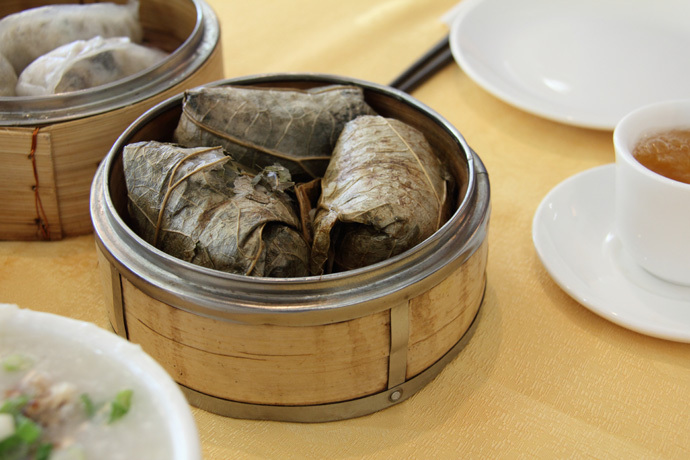 201 City Square, 555 West 12th Avenue, Vancouver, British Columbia, Canada, phone: 604-879-8038) is a fancy Cantonese restaurant that serves delectable Chinese seafood dishes and dim sum in an upscale atmosphere. We enjoyed a banquet meal at the Kirin on New Years Day 2009, and I took a video of the dishes (you can view it using the player below). The food was really amazing, although a foodie friend commented that the Kirin is a bit pricy to visit just for a casual dinner (save it for a special occasion!). 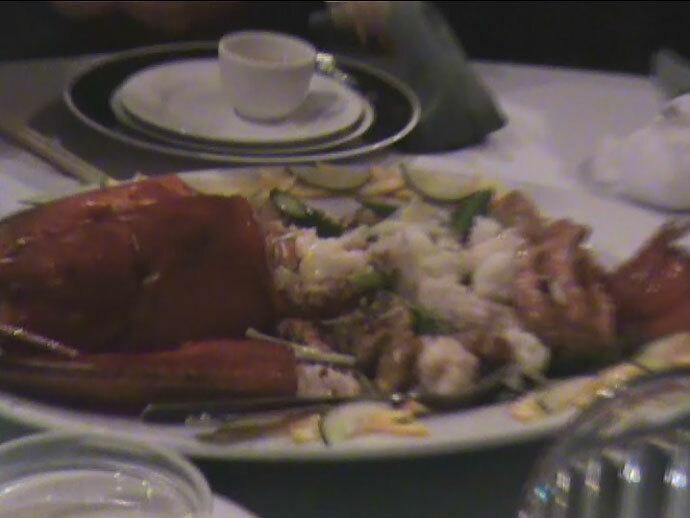 Still image from the video (Lobster) from the Kirin Chinese Restaurant in Vancouver (City Square). View More Restaurants in the Banquet category. We hope you enjoy the great Banquet restaurants on Dine Out Here Vancouver. Please note that prices may change without notice and restaurant information may be out of date. It is a good idea to phone the restaurant before visiting, to avoid disappointment. Please leave comments regarding corrections or updates. Jazz music fan? Check out Vancouver jazz band Geoff Peters Trio - Listen free to a song from their new album or on iTunes.